Alcohol consumption by youth in the United States of America is an umbrella term for alcohol consumption by individuals under the age of 21 in the country. Although the minimum legal age to purchase alcohol is 21 in all states (see National Minimum Drinking Age Act), the legal details vary greatly. While a few states completely ban alcohol usage for people under 21, the majority have exceptions that permit consumption. Underage drinking has become an activity primarily done behind closed doors. Typically, underage drinkers hide their alcohol consumption by drinking quickly before they go out, which is often referred to as pregaming or pre-partying. Brittany Levine explained in her article "Pre-Gaming" in USA Today that "of all drinking events involving pre-partying, 80% involved additional drinking afterward." Those who oppose a complete ban on underage drinking argue that it is important that minors be introduced to alcohol in a controlled environment, so that supervision and guidance might occur instead of experimentation. Some parents are willing to provide alcohol for their children if they drink it in a controlled environment. Furnishing alcohol to one's own children is permitted in 31 states, while it's illegal to do so for other people's children in all fifty states. Social host ordinances have been enacted in a number of jurisdictions to attempt to limit the parties where adults may permit minors to drink. Social host laws or ordinances have proliferated in the last ten years because it has been too difficult for law enforcement to prove which adults furnished or served alcohol to minors in their own home, so it permits them to cite or arrest the adult who has control of the premises. In 2007, the drinking age debate in the United States was renewed when Choose Responsibility began promoting lowering of the drinking age coupled with education and rules to persuade people to drink responsibly before they are of legal age. Before one is eligible to buy, possess and consume alcohol, an alcohol education class must be completed in its entirety and each teen must pass a final examination before licensing can occur. If a teen has any alcohol-related law violations before they turn 18, they will have a minimum of one year per violation before they are eligible to be licensed. In 2008, McCardell and the presidents of over 100 U.S. colleges and universities launched the Amethyst Initiative, a campaign to debate the effectiveness of present alcohol laws. In 2008, Gallup reported that 77% of the population over 21 supported the 21-year drinking age. As it stands, any state that lowers its alcohol purchase or possession age would lose ten percent of its federal highway funding. This could range from a $6 million–150 million loss for any single state. Most states in the U.S. regulate the use of alcohol by those under the age of 21. Many believe that anyone under the age of twenty-one can not consume alcohol in the United States. However, this is incorrect because underage drinking is allowed in 31 states with parental consent and 17 states with spousal consent, if the consenting spouse is over 21. Although the state laws pertaining to drinking by minors (defined as those under the age of 18) are presumptively constitutional, as valid exercises of the police power, to protect public health, welfare, and morals, there exists a question of whether laws forbidding the consumption of alcohol by those 18 to 20 years of age are Constitutional, as such individuals are considered legal adults for all intents and purposes other than that of consuming alcohol and running for certain State and Federal offices, such as the Presidency of the United States, which is restricted for those 35 years of age and older. Under the Constitution of the United States, Amendment 14, Section 1, "No State shall make or enforce any law which shall abridge the privileges or immunities of citizens of the United States; nor shall any State deprive any person of life, liberty, or property, without due process of law; nor deny to any person within its jurisdiction the equal protection of the laws". Many parallel State constitutional provisions similar to those contained in the 14th Amendment exist, and State constitutions often have explicit prohibitions against age discrimination, as well. Since citizens between the ages of 18 to 20 are adults, able to sign legal contracts, vote, be sentenced to death, and serve in the military, questions exist whether criminalizing alcohol consumption for these adults reduce them to a suspect class, thus depriving them of the equal protection of the law promised by the Equal Protection Clause; effectively deprive them of the privileges and immunities of citizenship protected by the Citizenship Clause; or infringe on the liberty or privacy interest protected by the concept of substantive due process implicit within the Due Process Clause. These questions were litigated before the Supreme Court of Louisiana, in Manuel v. State, 692 So. 2d 320, 324–25 (La. 1995); the Court originally found such laws criminalizing the possession of alcohol by persons between the ages of 18 and 20 to be repugnant to the Constitution of said State. However, when the Court was threatened by the Legislature therein with the passage of a Constitutional amendment overruling Manuel, they reversed it, finding that laws forbidding 18- to 20-year-olds from drinking were constitutional, due to the alleged benefits that these laws had on statistical rates of drunk driving. However, this decision only applies to the State of Louisiana. On July 14, 2009, South Carolina Magistrate Judge Mel Maurer for Richland County ruled that Article 17, Section 14 of the state constitution conditionally gives those 18 and over the "full legal rights and responsibilities" of all other adults, with one exception—the General Assembly can restrict the sale of alcohol, but that section of the constitution does not specifically address consumption or possession. Other challenges to the questions of the constitutionality of underage drinking laws have not been made, either in the Courts of the several other States, or in the Federal courts. The prerogative held by police to enforce underage drinking laws is also debatable under certain circumstances. For example, since no state requires its citizens to carry identification except when they are driving, it is presumed that underage persons are under no obligation to carry identification while drinking, and, if those persons were approached by law enforcement under such circumstances, could presumably simply state they were in fact of the legal drinking age. Since a hunch is not considered probable cause to detain someone in the United States, it is debatable what recourse law enforcement might have to determine if such a person was telling the truth. According to Frances M. Harding of the Substance Abuse and Mental Health Services Administration's (SAMHSA) Center for Substance Abuse Prevention, the SAMHSA's goal "is to change social norms". The Brief Alcohol Screening and Intervention for College Students (BASICS) program consists of a brief survey given to students to help them assess their alcohol usage against other students. It also consists of one or two counseling sessions granted to the students to provide support and not be confrontational regarding their alcohol use. As of 2002, a study found that students who completed the BASICS program "reduced their average number of drinks per week, frequency of heavy drinking by two percent, their peak Blood Alcohol Concentration by thirty-five percent, and their rate of alcohol-related problems by two percent." The Substance Abuse and Mental Health Services Administration created the "Talk. They Hear You" campaign that involved a mobile app to assist parents with having conversations about alcohol usage to their children. Those that are for lowering the drinking age generally argue that the moderate consumption of alcohol frequently as a complement to a meal or drink with friends is preferable to and healthier than the binge drinking habits more often associated with dry countries such as the United States. These opinions generally lead to the argument that it is far more effective and beneficial for laws to monitor, limit, and guide healthy drinking habits rather than to outright ban it. Furthermore, it is argued that alcohol abuse occurs—at least in part—as a result of the stringent drinking laws. Many of these proponents also argue that instead of there being a strict age limit, laws should be more gradual with suggestions such as having to take a test to get licensed to drink or implementing laws such as those in Europe that limit the type of alcohols or the setting under which they may be consumed. For those who argue for maintaining and even strengthening current drinking laws, however, citing past examples, generally argue that injuries and deaths related to are bad enough presently. They also argue that initiatives to implement gradual drinking laws or educational programs are optimistic and unrealistic. Furthermore, they propose that drinking and driving related problems are rampant enough among those who are not legally of age and that lowering the drinking age would only enable these habits further, causing an even higher volume of alcohol-related problems. 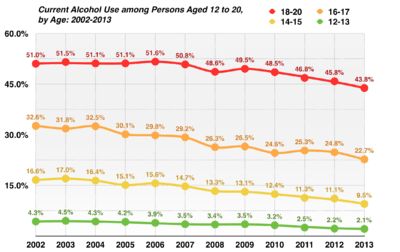 Current Alcohol Use among Persons Aged 12 to 20 in the United States. Although the incidence of underage drinking is still significant, government, university and national statistics have confirmed that alcohol use and binge drinking among high school students has declined steadily over the past three decades, and continues to decline annually. According to a United States Substance Abuse and Mental Health Services Administration study involving 30,000 youths aged 12 to 20 years old, between 2002 and 2013 the percentage of underage drinkers declined from 28.8% to 22.7%. Underage binge drinkers decreased 19.3% to 14.2%. A December 2014 study performed by the University of Michigan also found that 75% of senior high school students disapproved of drinking excessively on the weekends. Alcohol still proved to be the favored substance of abuse among American youths however, with tobacco and illicit drugs following in rank. Teenagers and young adults typically get their alcohol from persons 21 or older. The second most common source for high school students is someone else under age 21, and the third most common source for 18- to 20-year-old adults is buying it from a store, bar or restaurant (despite the fact that such sales are against the law). In the 12th grade, boys were more likely than girls to buy alcohol from a store, bar or restaurant. The higher a teenager's weekly income, the more likely he/she will buy alcohol from a store, bar or restaurant. It is easy to get alcohol at a party and from siblings or others 21 or older. How easy is it for youth to buy alcohol? 1 2 "Alcohol Policy Information Service". ↑ "Underage Drinking & the Law". ↑ Keen, Judy (April 1, 2008). "States weigh lowering drinking age". USA Today. Retrieved April 23, 2010. ↑ Barnhill, John H., PhD. "Drinking Age Debate." Salem Press Encyclopedia (2014): Research Starters. Web. 17 Feb. 2016. ↑ Paglia, Camille. "It's Time To Let Teenagers Drink Again." Time 183.19 (2014): 22. Military & Government Collection. Web. 17 Feb. 2016. 1 2 3 4 Gebelhoff, Robert (11 June 2015). "Alcohol use, binge drinking continues to fall among underage, report finds". The Washington Post. Retrieved 11 June 2015. ↑ "Campuses with Award-Winning Programs." Alcohol and other Drug Prevention Programs on College Campuses. 2003. U.S. Department of Education. ↑ What Drives Underage Drinking? An International Analysis. Rep. International Center for Alcohol Policies, 2004. Web. 7 Mar. 2012. ↑ Modlin, Gillian. "Underage College Drinking." Telephone interview. 21 Mar. 2012. 1 2 "Drinking and Culture: International Comparisons." Choose Responsibility: Balance, Maturity, Common Sense. Choose Responsibility. Web. 07 Mar. 2012. 1 2 Fell, James C. "WHY 21? Addressing Underage Drinking." MADD. Mothers Against Drunk Driving. Web. 07 Mar. 2012. ↑ "Results from the 2013 National Survey on Drug Use and Health: Summary of National Findings" (PDF). United States Substance Abuse and Mental Health Services Administration. United States Department of Health and Human Services. Retrieved 11 June 2015. ↑ "Underage Drinking & the Law - Statistics". 1 2 "Youth Alcohol Access". Archived from the original on 21 June 2013. "#1 Party School". This American Life, December 18, 2009. This American Life examines the party (and therefore drinking) culture at Penn State.